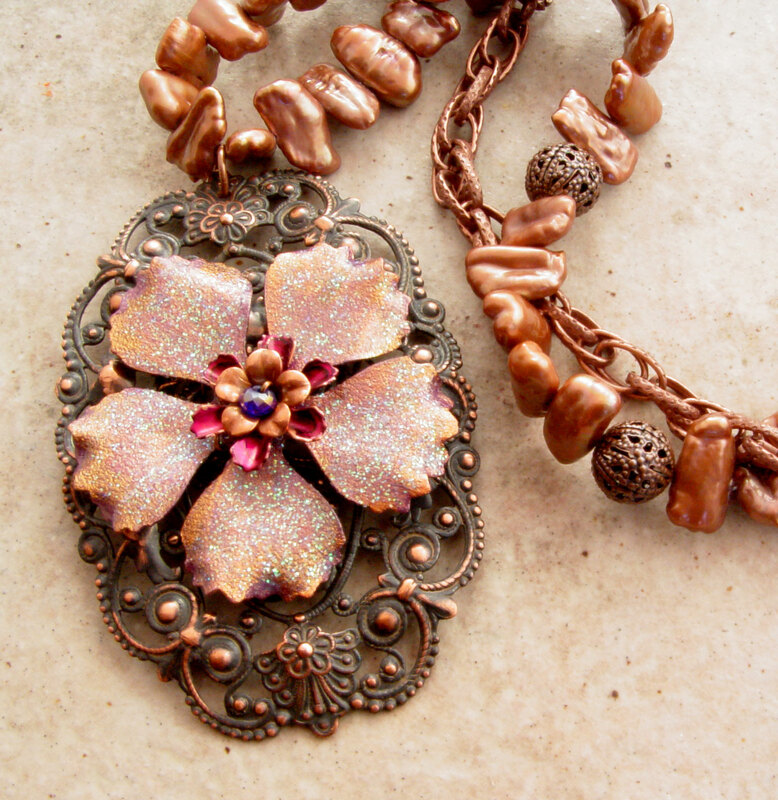 I’ve participated in Lori Anderson’s Bead Soup Blog Party several times and she’s such a lovely person to work with. One day, I hope to take her out for pie. 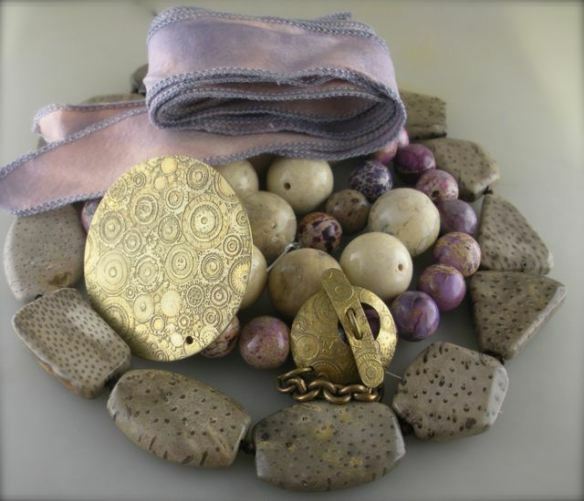 This Bead Soup catches me on my way (like airborne if you are looking at this Saturday morning) to Colorado to help my amazing mother with her second hip replacement in 4 months. So it’s been a crazy week wrapping up projects to get out of town and also keep two businesses running while I’m in the mountains. I’m a procrastinator…sometimes by choice and sometimes by situation. It was definitely situational this time. Add a little (OK HUGE) creative block and general trepidation to make Jen’s beads look good and you have an all out panic attack yesterday afternoon. And here’s the result! 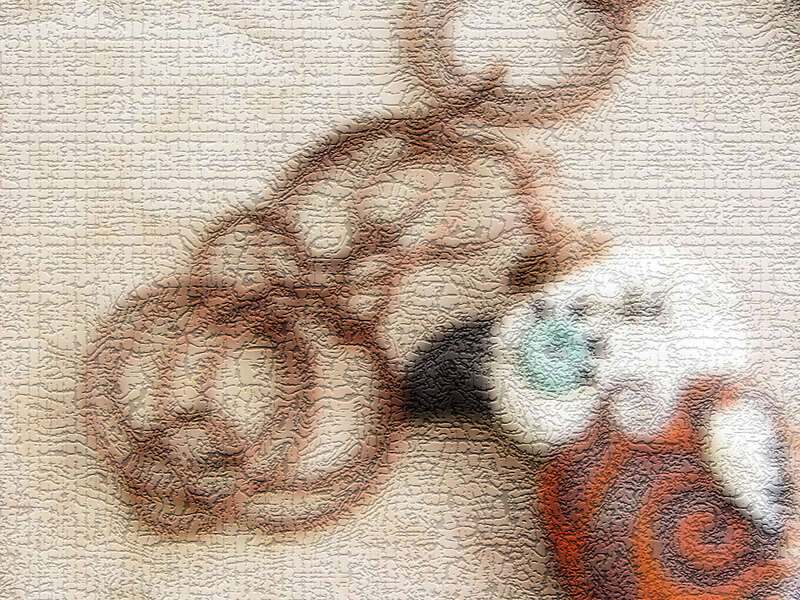 If you keep reading, you’ll see close up shots of the various components. 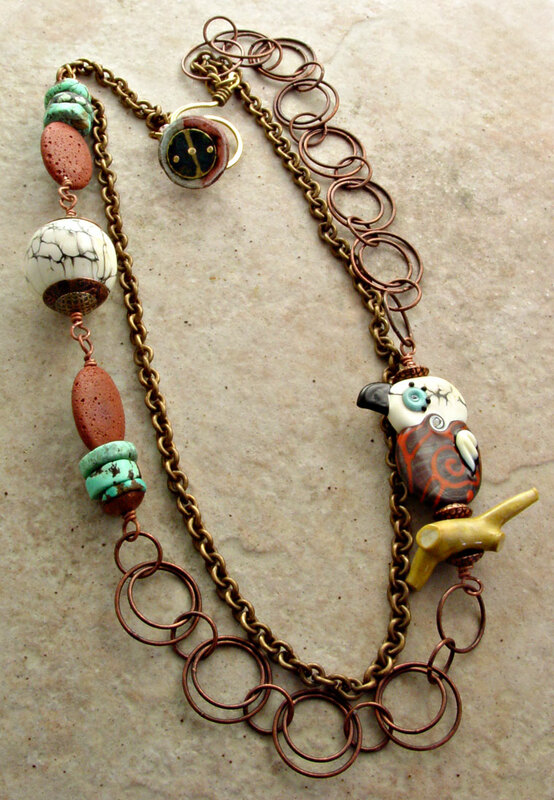 I wanted to showcase the awesome bird and also tie in the the hollow rounds, plus get the brass from the clasp tied in with the copper loopy chain. It was a major case of “edit thoughtfully” in the words of Tim Gunn. I was snipping and cutting right up to showtime! 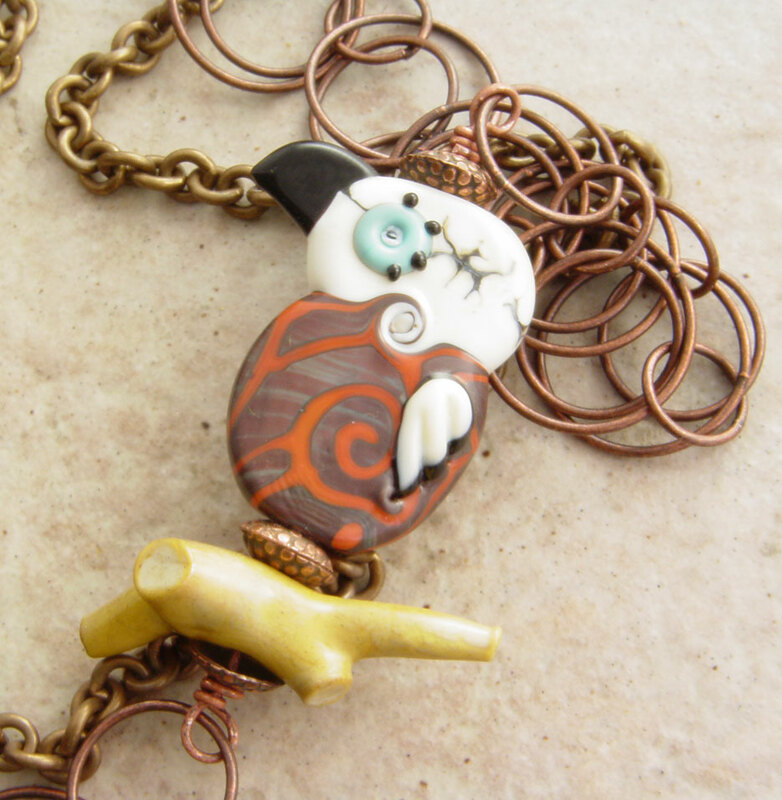 Here is a close-up of the bird, sitting on the branch bead with a few of my textured beadcaps for spacers to tie in the copper/metal theme. 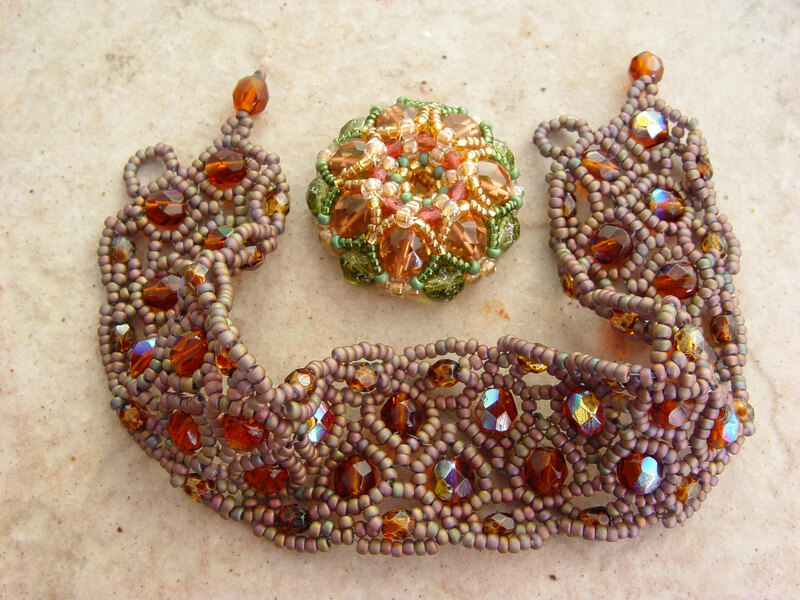 Next is a close-up of the other beaded element. I ended up going for balanced asymmetry (I may have just made up a phrase). This was where editing came in. Jen sent 4 of these amazing hollows. I tried to work more in and it just wasn’t working for me. 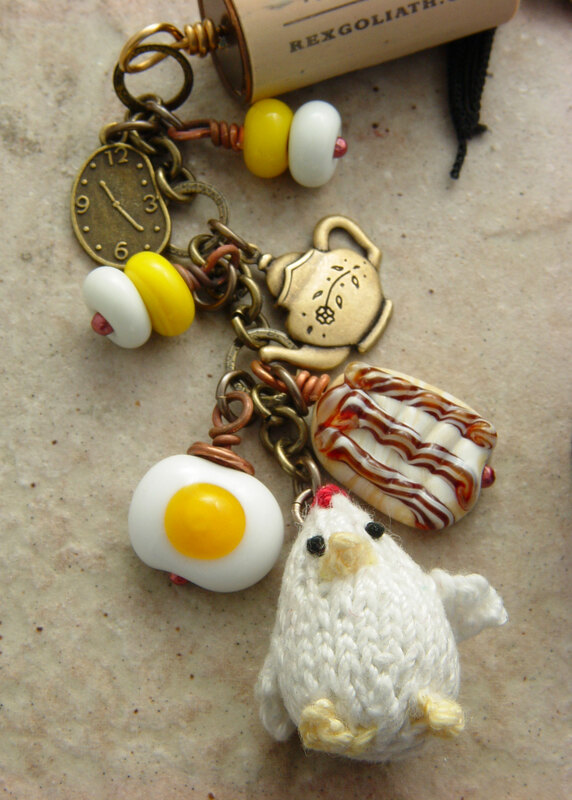 So you’ll see in the last photos that I made earrings from a couple. 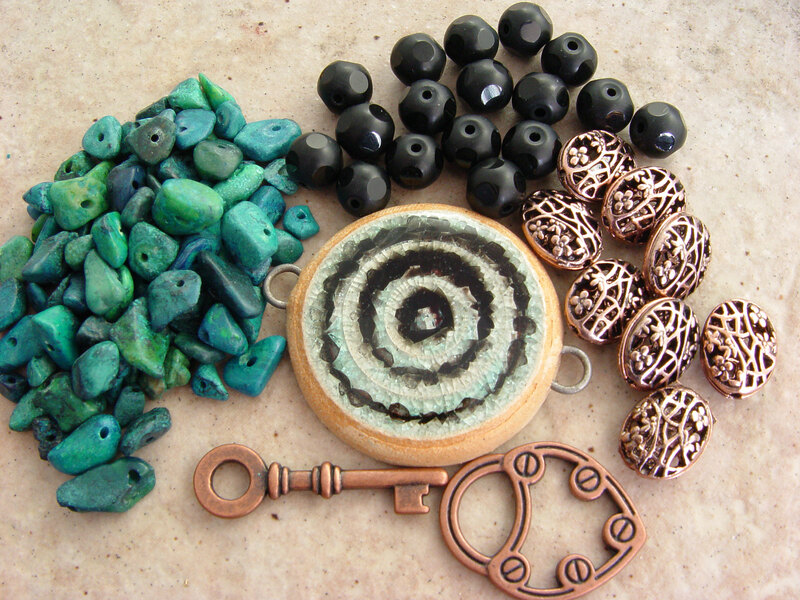 You can see one of the hollows with an etched copper and etched brass beadcap wired to some cool brick red lava stone that I had on hand. 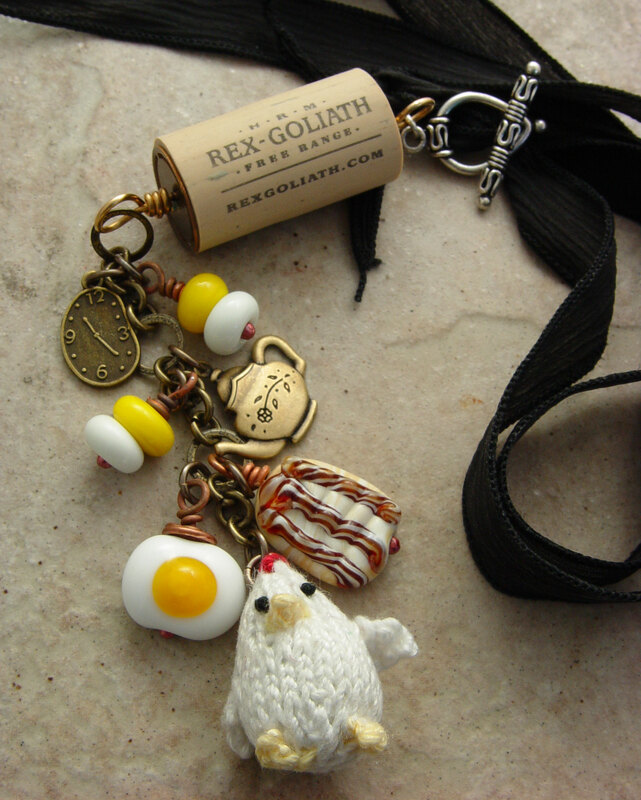 It went well with the turquoise rondelles that Jen sent. I started this off with two full strands of chain. 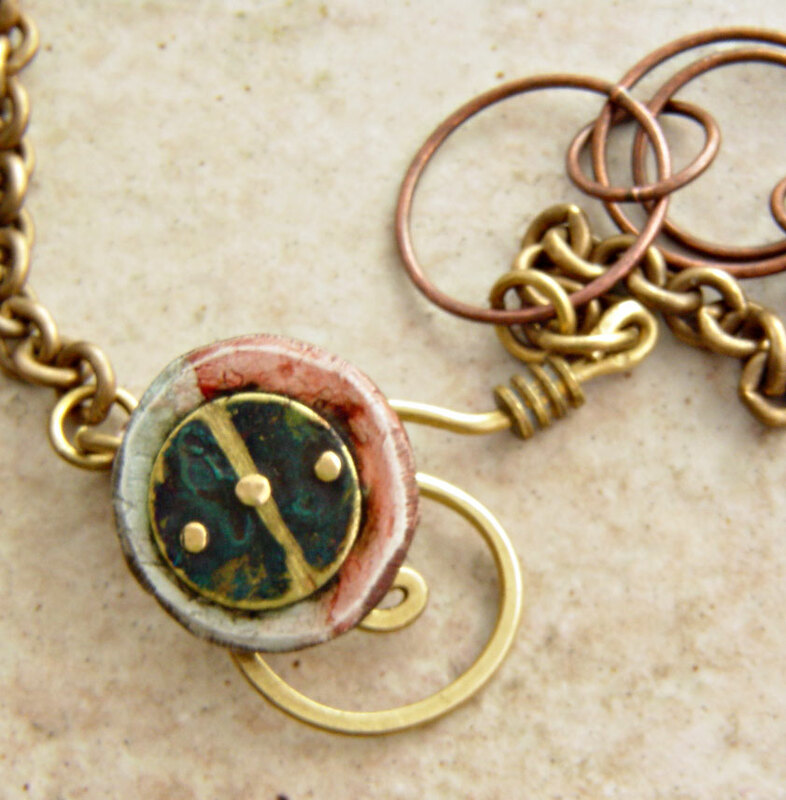 The copper circles in circles and the medium-weight brass chain. It just wasn’t working for me, so round two of “balanced asymmetry”. 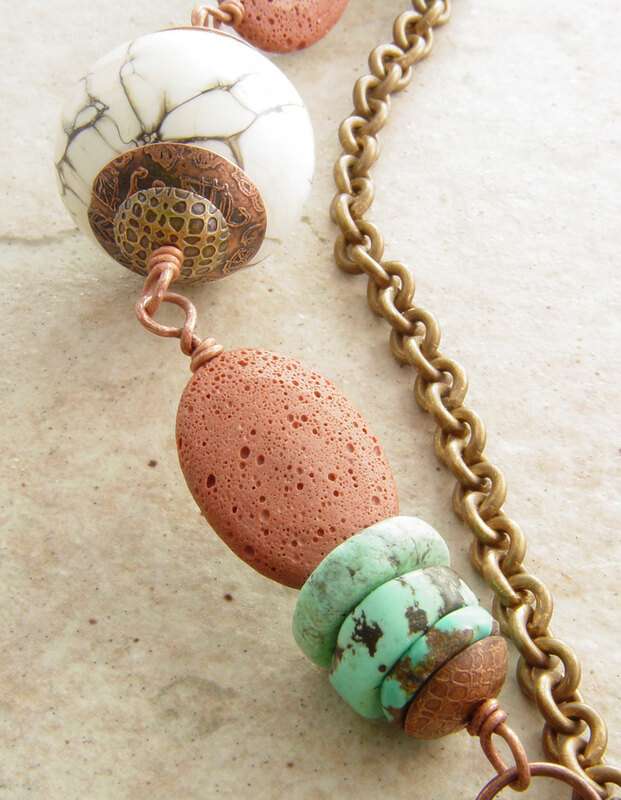 The copper chain wasn’t adding a thing to the hollow/lava/turquoise segment, so I ditched it. 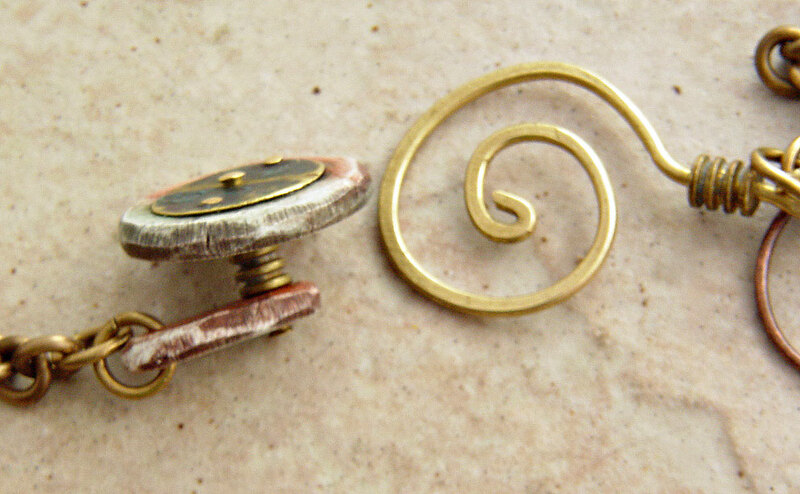 Last up (almost) is this amazing clasp that Jen made from brass wire and metal and stone. I really wanted to showcase it in front somehow, but I also wanted it in the same piece as the bird focal. So, it lives as a traditional closure in the back. The good news is my hair is usually very short in back so it will be visible when I wear this. Here’s another view of the component. It really is amazing. I think you’ll be seeing more of these from Jen. So, there you have it! 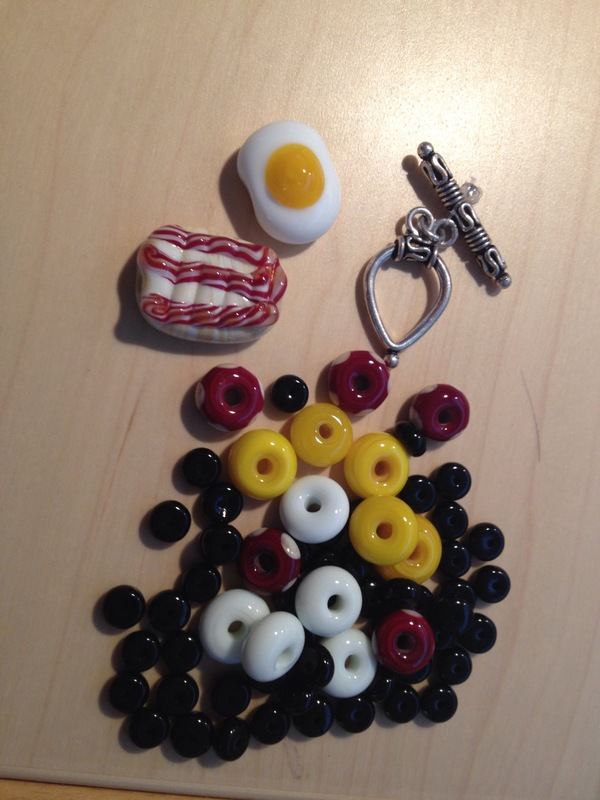 Oh, wait…I said “earrings” earlier, didn’t I. 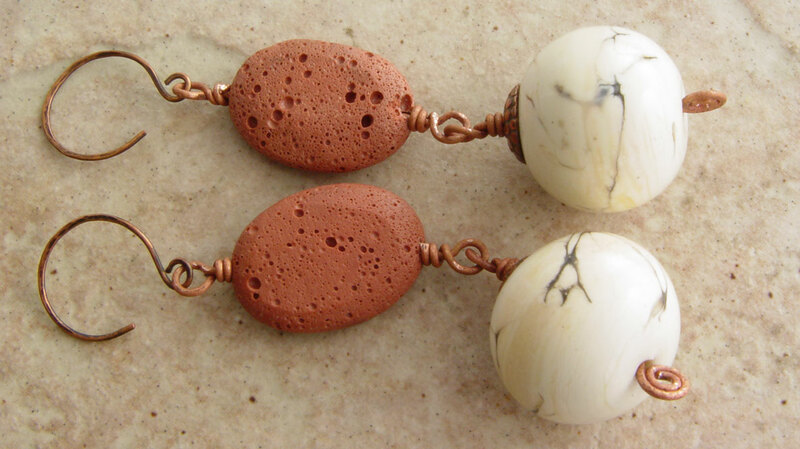 Here are the earrings I made to wear with this. they look heavy, but they aren’t. 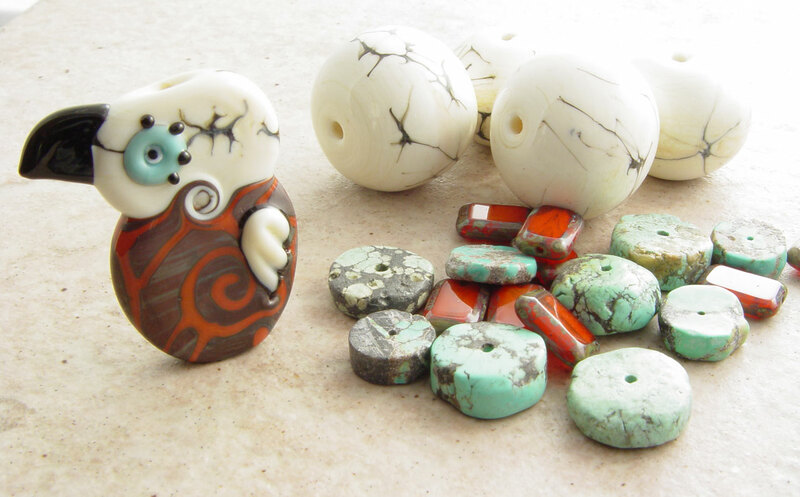 The lava beads are very lightweight, as are the hollows. 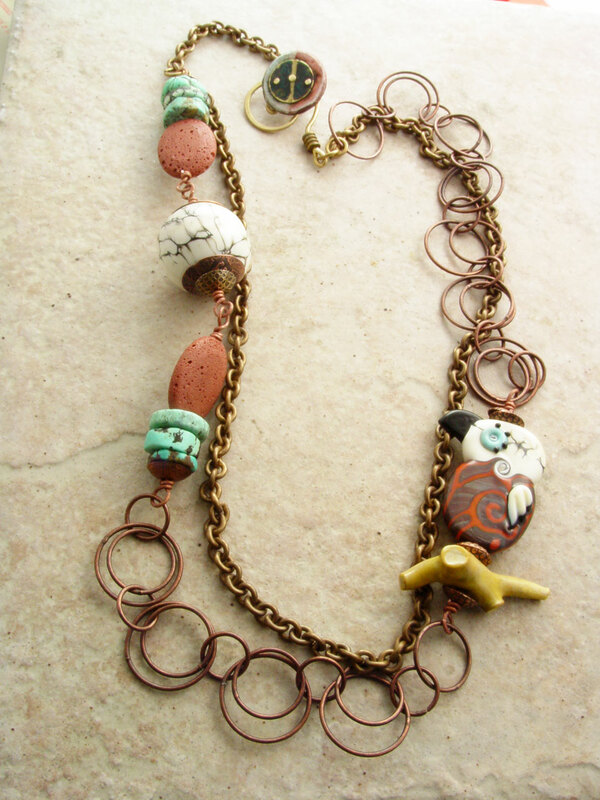 And one last shot of the full necklace. Thanks for stopping by. 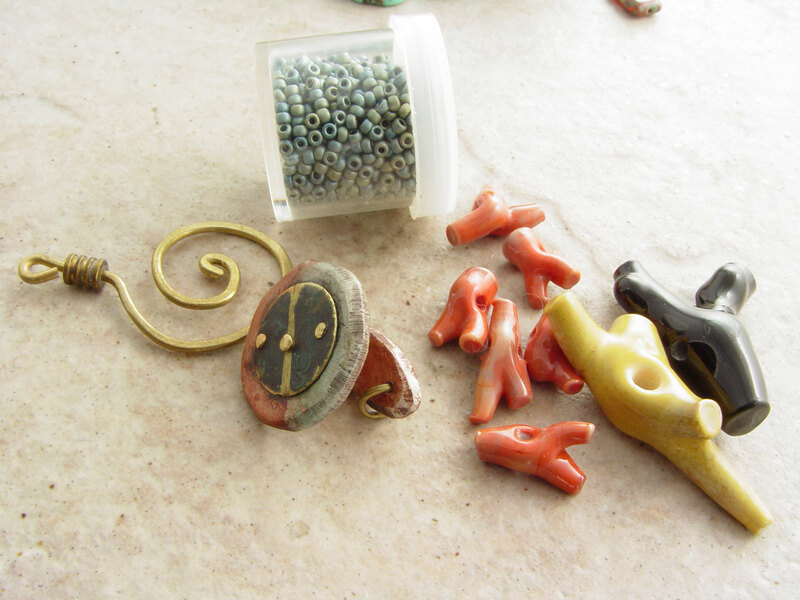 Now head out to see the other great Bead Soup results. Thanks to Jen for an amazing batch of ingredients. 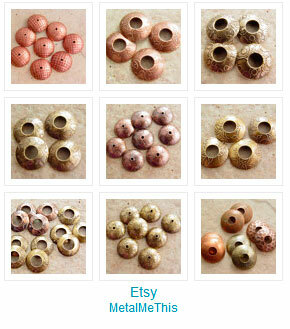 Stop by her blog to see what she made with what I sent to her. 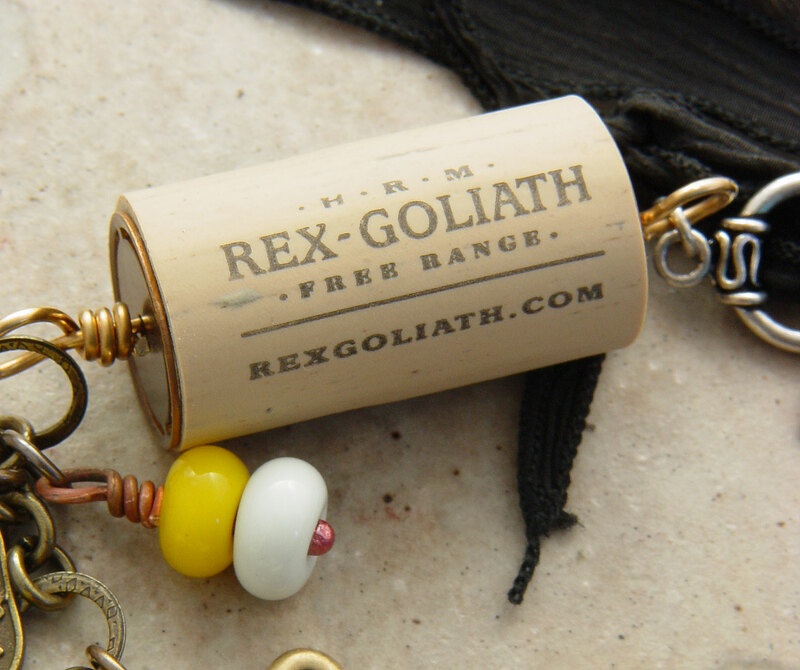 And if you leave a comment, I’ll enter your name in a drawing for a pendant with the last Jennifer Geldard ivory hollow bead…it’s half-finished…by the time everyone gets through the blogs, I’ll be done and one of you lucky people will be the winner. Here’s the list: Click on each name to go to their blogs. Sorry about the missing TTOTW post. The computer side of the house has been stealing all the time. Next week! And I’ve been waiting to post this so I could borrow the Wirework magazine photo of my project, since you know it will be styled better than my photo. But, I’m going to skip ahead and unveil my project from the magazine. If you don’t have the August issue, go out and get it. 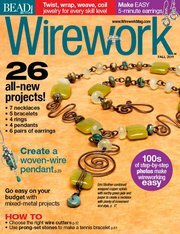 There’s no subscription to Wirework…it’s a buy or order kind of magazine, loaded with great wire-based projects! 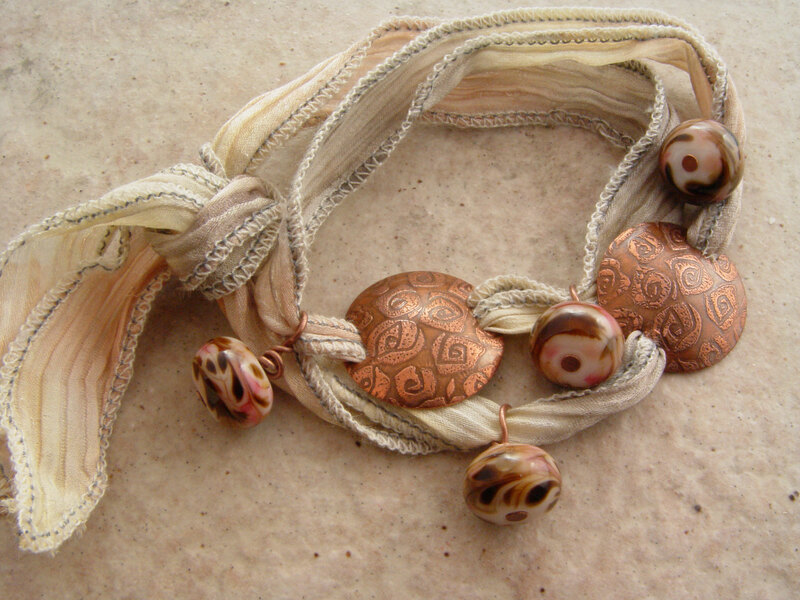 I submitted a copper wire necklace that used a modified version of a pattern that Maria Richmond taught several of us a few years ago at a bead get-together. 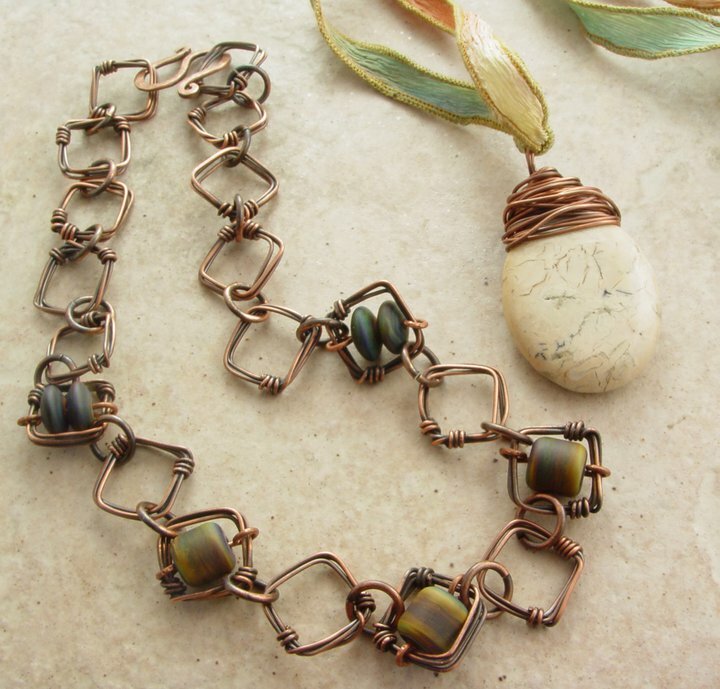 Cool tangled wire elements and etched lampwork beads by one of my favorite beadmaker friends, Angie Ramey (BeadAddicts). 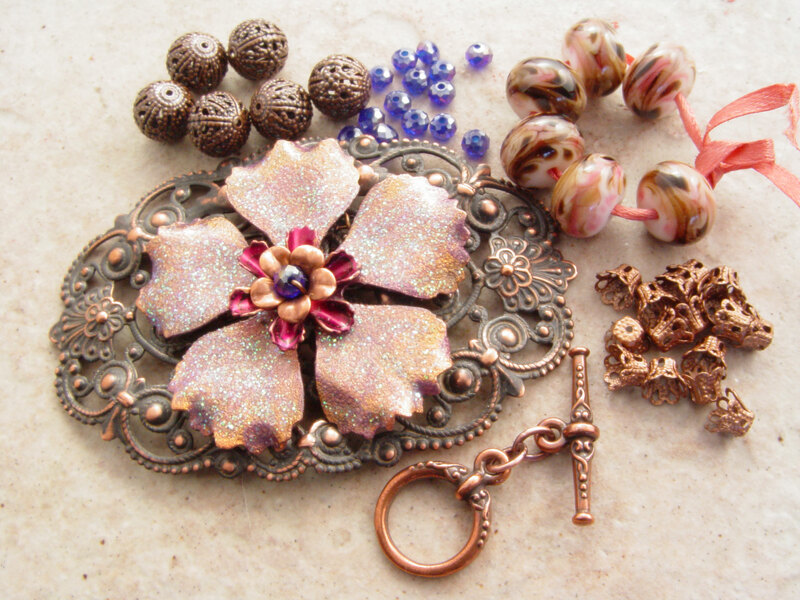 Maria teaches in Pennsylvania and around the country at BeadFest and will be teaching at Bead & Button in 2012. 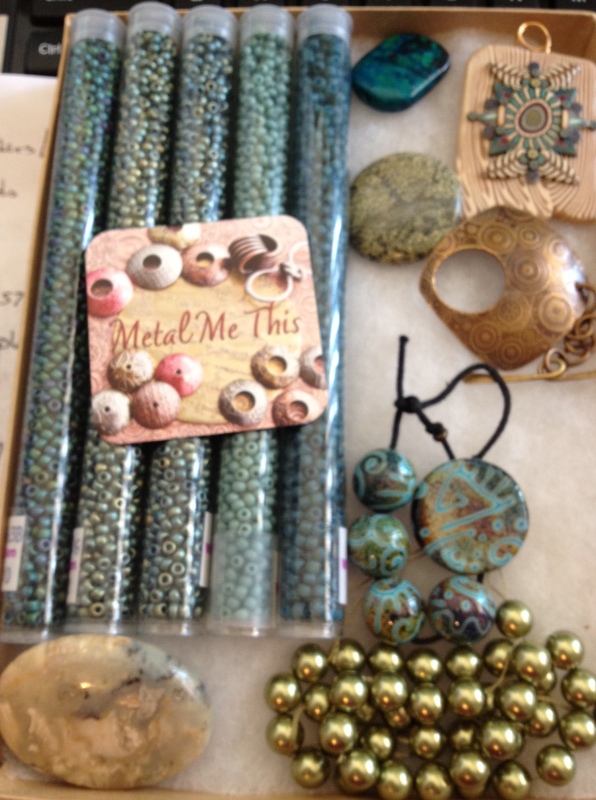 Angie and her lovely mama, Vern, have a bead studio in Crossville, TN and sell on Etsy. The necklace is a success because of their input. Thanks ladies! 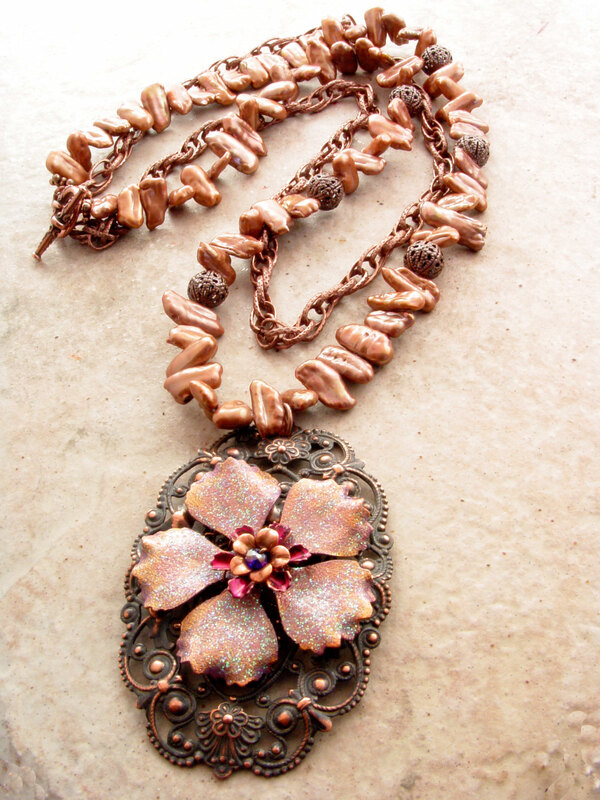 So, here’s my photo of the finished necklace. It’s very “fall” in the color palette. 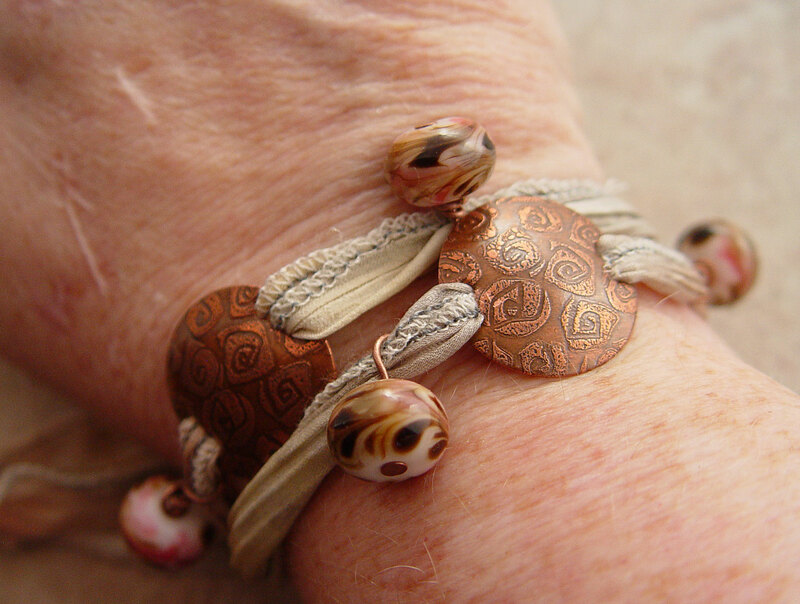 And copper wire is very popular given the continuing skyrocketing prices of sterling silver (almost $42/oz today). ETA: The magazine project is the necklace on the left…apparently I don’t have a good photo of the necklace without the simple wired pendant next to it. Oh well! I’m working on my project for the February issue and should have it to the project editor in a couple of weeks. You know I’ll keep you posted on when that issue is published! I haven’t decided if I’m keeping the necklace or putting it up for sale. Hard to think of autumn when we had another heat advisory day here.